Distribution: Vernal pool tadpole shrimp inhabit California’s Central Valley and are found in scattered populations from Shasta County to northwestern Tulare County. They have also been reported in Placer, Sacramento, Sutter, and Yolo Counties. Although they have been found east of the Natomas Basin, they have not been documented within the basin. Habitat Requirements: Vernal pool tadpole shrimp live in seasonal pools that dot the grasslands of the Central Valley. Water in these pools is clear to murky and 50″“84 degrees Fahrenheit, and the pools range from 55 square feet (5 square meters) to almost 90 acres (36 hectares). These pools flood with winter and spring rains and dry out in the summer. This cyclical, wet-dry aspect of their habitat is vital to the survival of the species, as vernal pool tadpole shrimp have no defense mechanisms against the predatory fish that inhabit water bodies that do not regularly dry out. Reproduction and Demography: Vernal pool tadpole shrimp complete their entire lifecycle within the seasonal pools flooded by winter and spring rains. Adults can reproduce several times within one wet season, and some adults can produce fertilized eggs on their own. Adult vernal pool tadpole shrimp die when the pools dry out, but eggs are surrounded by a shell that protects the embryo from drying out. These cysts remain in a dormant phase””also called diapause””for years if necessary. With suitable temperatures and rainfall, some cysts in the vernal pool soils will hatch, sometimes in as few as four days. The rate at which the young reach sexual maturity depends on water temperature, but sexual maturity usually occurs between 21 and 28 days. Movement: Vernal pool tadpole shrimp can be transported between neighboring pools by flood waters. Adults and cysts may also be carried to new pools when caught on the legs and feathers of wetland birds. Cysts can pass unharmed through the digestive system of other organisms and may be deposited in new locations through this process. Ecological Relationships: Vernal pool tadpole shrimp consume both organic detritus in the sediment and live prey, including amphibian larvae and other freshwater crustaceans. 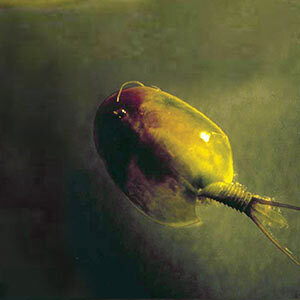 Vernal pool tadpole shrimp are themselves a high-energy food source for a variety of waterfowl and shorebirds. Like other vernal pool branchiopods, the vernal pool tadpole shrimp has a reproductive strategy that is tied to the unpredictable habitat in which it lives. With no guarantee that a pool will stay wet long enough for hatching cysts to complete their lifecycle, having only a portion of cysts hatch in any given season makes it possible for the species to survive years of insufficient rainfall.